Dupuytren's contracture is characterised by the development of hard connective tissue in the palm of the hand and fingers. In the long term this can result in the fingers no longer being able to extend fully. It is worth noting that this condition almost exclusively affects people with a pale skin colour. Men are affected more often than women. The symptoms primarily occur in people over the age of 30 years. Dupuytren's contracture causes hardening of the connective tissue in the "palmar fascia". This is the flat white sheath located in the hand palm around the flexor tendons running to the fingers. The hardening or lumps are called "nodules" ("nodule" = lump). As more and more nodules develop, they form a strand of connective tissue that contracts over time. This pulls the finger into a flexed position, making it impossible to extend. A so-called "flexion contracture" develops. The nodules develop between the skin and the tendons. The tendons themselves are not involved in the disease process. The ring and little finger are often affected, but the symptoms can also occur in other fingers. The symptoms regularly occur in both hands. The symptoms develop gradually. It starts with slight hardening in the hand palm and fingers, which develops into nodules. Over the course of months or years these nodules can develop into hard subcutaneous strands of connective tissue that force the finger(s) into a flexed position. The cause of Dupuytren's contracture is currently unknown. Inflammation, trauma, new tissue formation and genetic factors appear to play a role. Genetic predisposition is particularly prevalent in some families. There is a family history in approximately 12 % of cases. The condition is also partially associated with diabetes mellitus. Alcoholics, smokers, patients with hypercholesterolaemia or liver problems also have a higher risk of developing Dupuytren's contracture. HIV patients and people who use anti-epileptic medication are also at increased risk. Rigid strands of connective tissue and/or hard lumps in the hand palm. The lumps are generally not painful. However, the strands and lumps can cause pain when using the hand. The strands run over the palm of the hand to the fingers, usually to the ring and little finger (sometimes also to the thumb, index finger or middle finger). The hand palm and fingers can bend over the course of months or years. They can no longer extend. Stiff fingers as a result of withering of the joint capsule of the finger joints. 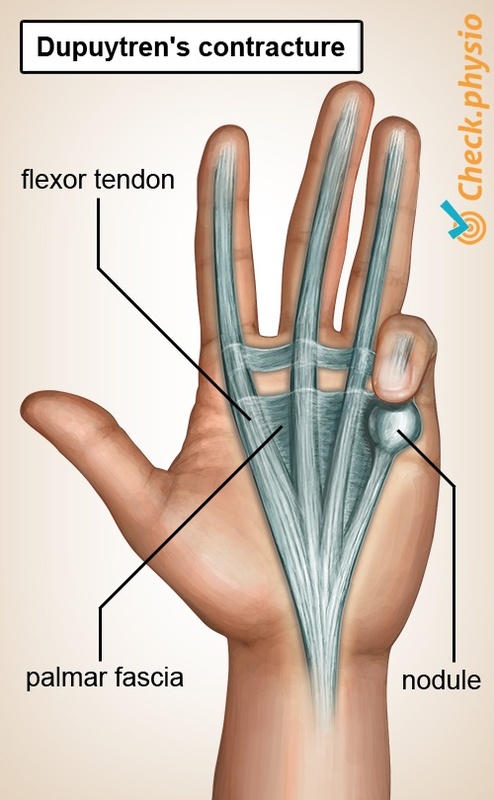 In some cases a reduced sensation will be present in the fingers, because a nerve can become impinged by the connective tissue strand. Grade 1: A thickened nodule or strand of connective tissue in the hand palm. Grade 2: As for grade 1, with a slight limitation in extension of the finger. Grade 3: Advanced stage, extension of the finger is severely limited. The curvature of the fingers is measured to gain a more accurate impression of the stage of Dupuytren's contracture. As the cause is unknown, treatment is aimed at combating the symptoms. The physiotherapeutic treatment consists of stretching the contracted strands. This must take place in a controlled manner, in order to prevent extra scar formation as a result of micro trauma. A night-time splint can be used to improve the extension of the fingers. An injection can be administered to "soften" the tissue. The connective tissue strand is then torn off. A needle is used to pierce through the skin into the connective tissue strand to cleave the strand. This is performed under anaesthetic and results in minimal scar tissue formation. Surgery can be performed to cleave or remove the affected tissue. Surgery can greatly reduce the pain or nuisance experienced by the patient. The curvature of the fingers is corrected with this surgery. The aim of the treatment is to maintain use of the hand. Unfortunately, for all treatments, the symptoms will return over time in many cases. Dupuytren's contracture cannot be cured. Nederlandse Vereniging voor Plastische Chirurgie (2011). Richtlijn. Ziekte van Dupuytren. NVPC.